Adam, 40, UK, has a wife, two young kids and a demanding job with significant travel. He signed up for coaching in late October 2017. On New Year's Eve 2017, Adam solo time trialled a 10k run on the track. The result? A fantastic 39:53! Making easy runs easier, and hard runs even harder. Focusing less on top-end speedwork (like 400 m track intervals) and more on threshold and race-pace intervals and sustained efforts. Introducing run-specific core strength, conditioning, and mobility. How could Adam train to run five minutes faster over 10 km in 9 weeks while balancing a career and young family? Let's start by introducing Adam to put some context to this case study. At the time of this story, Adam is 40 years old. He is from the UK but lives in Stockholm, Sweden, with his wife and two young kids. He works a corporate job with a lot of responsibilities including travel. He has done quite a bit of endurance sports in the past, including a full Ironman. It has been a bit on and off, though, depending on where in the world he's been living. In the last few months, he has already got his 10k run time down significantly to just above 45 minutes. He hasn't run under 40 minutes for the 10k since his twenties, but that is now the target for the next nine weeks. Break 40 minutes by New Year's Eve 2017. Adam's Peak paces from recent months for specific durations. Peak 20- and 60-minute paces are good predictors of 10k-performance. Since the fastest 20-minute segment Adam had recorded was at 4:32 km-pace (7:17 mile-pace), and there wasn't even a single 5-minute segment run at the target 10k-pace of 4:00 (6:26 mile-pace), it looked like an almost impossible task. And that's what I told Adam. I said, "Look, you can get down to the 41-42 minute range with a solid 9-week block, recover a bit, and then do another targeted training block to maybe bring it down below 40-minutes". This is an important lesson from this story. Assess where you are fitness-wise, and set your expectations and goals accordingly. Another aspect Adam had to deal with was having a family with two young kids, and a demanding job that included travel. We agreed that for Adam to get the most out of his training and give himself even a remote chance of getting close to 40 minutes, his main priority needed to be excellent planning so he could achieve excellent consistency in his training. Without that, he could have the best training plan in the world, and still not come close. This is another important point. Before even starting the discussion about specific training, you need to have a clear idea of how much training you can commit to. And then you need to commit to making that happen through some very deliberate planning. This, in my opinion, is the piece that is most often missing for athletes that fail to achieve their goals. With Adam, we used a somewhat unconventional method to deal with any sudden travel and family obligations that might come up. We decided not to schedule any recovery weeks. The thinking was that inevitably, there would be occasions when a last-minute travel notice forced Adam to skip training anyway, so that would function as his "recovery blocks". Before starting training for a specific goal, assess where you are fitness-wise, and set your goal, expectations and of course, training, accordingly. Get clear on how much training you can commit to. Don't do yourself the disservice of over-estimating what your number is. When you have your number, you need to follow through and commit to making that happen through deliberate planning. 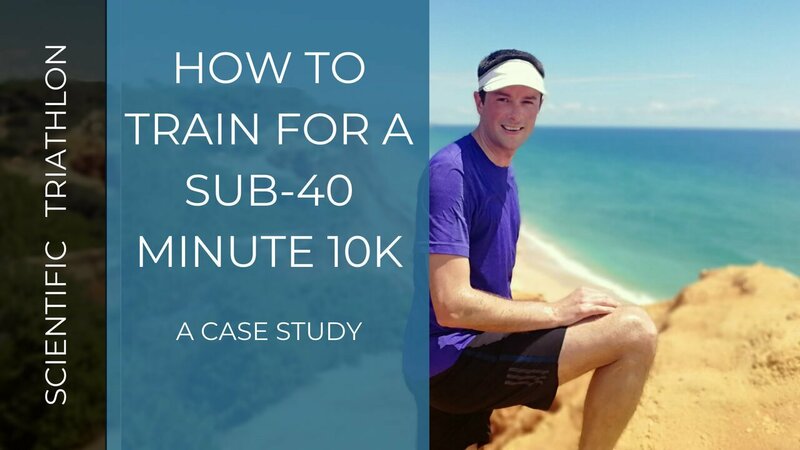 Adam was originally using a free 10k training plan he had found online for his training. While it was not a bad plan by any means, we made a few changes to it. In addition, after going through his training data we also made some changes to how he was executing his workouts. Making his easy runs easier, and hard runs harder. Focusing less on top-end speedwork (short VO2max-type track intervals like 400 m repeats) and more on threshold and race-pace intervals and sustained efforts, plus VO2max/threshold intervals that were more aerobic in nature than the initially planned intervals. Introducing run-specific core strength, conditioning and mobility. Easy runs easier, hard runs harder! Most endurance athletes who haven't in the past had anybody monitor and check in on their training end up doing their easy workouts too fast. Their hard workouts are still hard, but not quite as hard (and therefore beneficial) as they could be if the easy runs were done at a slower pace. Despite an evidently massive fitness improvement (Adam did go from 45+ to sub-40 for the 10k after all), his average weekly run pace remained almost exactly the same. What was different was that when he ran hard, he really ran hard in the November - December period, but when he ran easy, he really did run easy. Adam's training plan contained a very significant amount of hard intervals in Zone 5 (VO2max-intensity), or even Z6 (anaerobic intervals). Although that is excellent training for almost any runner who wants to improve over almost any distance, we decided to sacrifice some (not all) of that work for more quality workouts in Zone 4, right around his functional threshold (or anaerobic/lactate threshold). This is also right around 10k-intensity, so it is a very race-specific intensity. Examples of these kinds of workouts would be 8-9 intervals of 1 km at threshold intensity with 1 to 1.5 minutes active recovery between intervals, or 5 x 1-mile intervals with similar active recovery. Adam also did a fair amount of sustained threshold runs, that might be 25 minutes or so of continuous running at or just below threshold intensity. We also changed the nature of some of those track workouts with shorter intervals. We made the intervals longer and added more total volume of them in a given workout. So a 10 x 400 m workout might become 7 x 800 m. Naturally, the intensity in the latter case is going to be a bit lower. If we talk about intensity as a percentage of Functional Threshold Power (Adam uses the Stryd running power meter), the 400s in the first case might be run at 120+ per cent of FTP, whereas the 800s would be at around 105-108 per cent of FTP. The former case does add aerobic development, but it also works the anaerobic system a lot (the intensity is Zone 6), which isn't a necessary emphasis in the final build phase for a 10k. The 800s, on the other hand, remain aerobic and are therefore more beneficial in this final preparation phase for a 10k. The 10k is, after all, an almost exclusively aerobic endurance event. The chart below shows how Adam's run power was distributed in his November - December training block. As you can see, he did a great job at hitting the intensities the way we had planned, with the majority of the time spent at Zone 2 (aerobic endurance), but focusing the quality workouts around Zone 4 (threshold intensity). Power distribution histogram for November - December 2017. X-axis: run power in 10-watt bins. Y-axis: time in minutes. To mitigate the risk of injury. Focusing only on running was a relatively recent shift for Adam. This meant he would be particularly susceptible to injury, and when do injuries happen? When form breaks down at the end of a long or hard run. That's when some muscles may stop firing, and others take over to compensate. And that's when injuries happen. To delay and minimise this form breakdown, run-specific core training and mobility are essential components of any run training program. When form deteriorates with fatigue, you also become less economical. Meaning, for the same amount of energy expended, you go slower. Doing core training may not help you run faster in the first half of a 10k, but it certainly will in the second half when your glutes keep firing, your posture remains stable and upright, and you can keep a quick ground contact time rather than sinking into the ground due to fatigued hips. Mobility can improve performance from the very first second of a 10k. Running (not to mention cycling) tends to severely limit hip flexibility and mobility, which can lead to a shorter stride, and therefore slower running. Ankle flexibility is another important aspect of fast running since it helps you get an effective push-off and fast ground contact time. Working in a little bit of mobility work in your training week can in this way give a massive return on investment to improve performance. As per the mandatory training requirements for any athlete that I coach, Adam diligently did 2-3 core and mobility sessions per week and commented after his successful goal race that this was one of the surprising key factors behind his achievement. I have made some of my best core routines available for free access for Scientific Triathlon Newsletter subscribers. Sign up below and get started in just 15 minutes a few times per week. 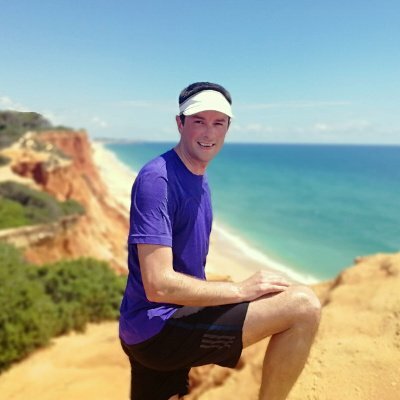 Adam started seeing great improvements in his running performance in workouts, but would the 9 weeks he had be enough to get all the way to his dream goal? We could easily get side-tracked here and view pretty charts and metrics for measuring progress. But when it comes down to it, the best measure of performance is performance itself (quote credit to Dr Andy Coggan).
" The best measure of performance is performance itself." Therefore, let's look at Adam's key workouts in the table below, how they progressed and how his performance in them improved over the 9-week plan. While Adam did run his 10k pretty much at his threshold (or @ FTP as it's termed in the table), earlier in the program, his threshold pace was significantly slower than his target race-pace. So these race-pace intervals are in fact at an intensity harder than threshold, similar to the long threshold/VO2max intervals in the borderland of the threshold and VO2max training zones. Due to weather conditions and travel, many of Adam's key workouts were run on the treadmill. Having the Stryd power meter was invaluable in this situation since it accurately measures power even on a treadmill. Treadmill pace, however, is very inaccurate, so we simply ignored the pace data, and trusted that if Adam could improve his run FTP and extend his Time To Exhaustion at his FTP, it would translate into being significantly faster when he did get to go outside and run again. In addition to power and pace (when running outdoors), we also paid close attention to Adam's Running Effectiveness (RE). This means simply how fast you go in relation to your power-to-weight. RE can be calculated at any given moment, as an average for an interval, or as an average for an entire workout. We were particularly interested in Adam's RE at or around his FTP and his race pace and race power. We knew that there was a lot of room for improvement there, and this could be potential "free speed" for his 10k. Note that since RE requires accurate pace data to be calculated, this too is only available from outdoor runs. Travelled in the morning, ran on empty stomach, but went ok.
Treadmill run. No relevant pace data. Travel day again. Outdoor track. New 5k PB in the process! Race-pace: 6 x 1k / 1'30"
Power still a bit high for the sub-40 10k pace to be sustainable. Currently on track for 41:00-41:30? Too much snow on the track -> treadmill run (no accurate pace data). Problems with treadmill speed fluctuations / poor calibration -> potentially overran the test and couldn't complete it. Did 6 x 800 and not 7 x 800 due to fading. Treadmill run due to bad weather (no accurate pace data).Treadmill runs seem to always be a lot harder than outdoor track runs. Ran on fairly flat but muddy trails. 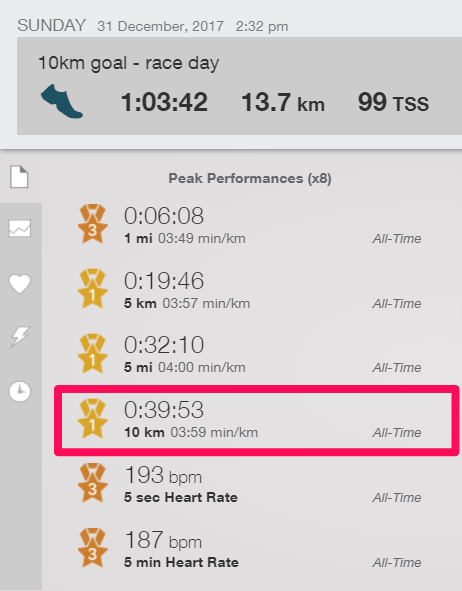 Good achievement to hold ~same pace as last race-pace workout that was on the roads today on trails. Treadmill run. No relevant pace data. Great breakthrough to sustain threshold for almost the duration of the target 10k. Treadmill run. No relevant pace data. Struggled towards the end of this workout. Probably due to the very demanding previous key workout. Treadmill run. No relevant pace data. Comfortable run today. Road run. Undulating and somewhat icy. Outdoor track. Breakthrough run, now we know that a sub-40 is absolutely possible next week. Outdoor track, quite icy in places. Good last preparation for a fast 10k in 6 days. So what can we tell about Adam's progress from looking at this table? First, his power (and pace) improved massively over the course of the training program. For example, in his Week 2 workout of 5 x 800 m (3-minute recoveries) he held an average of 374W. In his Week 8 workout of 4 x 1000 m (400 m jog recoveries) he held 392 W. That's a 5% improvement! Second, and more importantly, his sustainable power and time to exhaustion around threshold or race intensity improved massively as well. For example, in Week 1 Adam ran 20 minutes continuously at 336W (99% of FTP). In Week 6, he had almost doubled that duration and managed a monster 38 minutes at 340W (100% of FTP). Amazingly, his average heart rate was much lower in the second, longer workout (172 vs. 179 in the 20-minute threshold workout). I can't emphasise enough the importance of working on this sustainable power. Even if we would have seen no increase at all in power over the course of the program, the increase in sustainable power alone would have made Adam come very close to the sub-40 10k. This is why so many of Adam's workouts (and this goes for both continuous and interval workouts) were specifically geared towards improving this ability. Finally, although the trend is admittedly a bit blurry, there is a trend towards improved running effectiveness. More speed for the same power. Keep in mind that RE can only be compared across similar intensities and conditions (surface, wind, hills all impact RE). So consider the Race-pace workouts in weeks 3 and 5, and the threshold workout in week 9. These workouts are all run at similar intensities: 106, 105, and 107% of FTP, respectively. And the RE trend is very positive: 0.96 (poor RE), 0.98, 1.02 (well above average). With all of these positive trends, we gradually shifted Adam's expectations and goal, from the initial "at best 41-42 minutes", to "41 minutes is on the cards", to "man, you're on fire, let's go for the sub-40". Now let's talk about the big day and how it ended up going. 39:53 and Mission Accomplished! It was a nail-biter, but a massive success, given that at 9 weeks earlier I had told Adam that I thought the best he could hope for was a time around 41-42 minutes. 31st of December arrived and Adam headed to the track in a chilly Stockholm to do his 10k as a solo time trial. 25 laps around the track with no-one but himself for company. Luckily, the track was free from snow and ice, so decent conditions given the time of year. And boy did Adam take advantage of this last opportunity to run a sub-40 10k in 2017. With a finishing time of 39:53, he just broke the barrier. And we went on to have a very cheerful Skype-call with Adam still on the track right after finishing, celebrating his success!
" I was so pleased to beat the 40-minute time. Especially on New Year's Eve!" As you can see in the workout details chart above, Adam's race execution was near perfect. Race details. Click to zoom. He had very even splits, with 3:57 vs. 4:01 km-pace for the first and second 5k (6:21 and 6:27 mile-pace). And his power was right on target with a 347 W average (4.2 W/kg) and 1.02 IF (in other words, he was running at 102% of his threshold power). Adam commented afterwards that it was tougher mentally than physically. This is absolutely no surprise. We knew by now that he was capable of a sub-40 10k based on his performances in training. But that doesn't guarantee anything. He still had to get the absolute most out of himself on race day and push himself to the limit to realise his potential and get his sub-40. That he did magnificently. And this is where race-specific training really comes in handy. It's one thing to push yourself to the limit for 12 x 400 m around the track with long recoveries, and another to push yourself to hold threshold power for 30 minutes in training. The latter is not only race-specific physiologically, but also psychologically, making the race slightly easier to endure when the going gets tough. For those of you interested in stats (perhaps, in particular, running with power stats?) see the race stats below. So what were the main insights from Adam's successful training campaign and how can you apply this in your training? After all this analysis of everything going into Adam achieving his goal, how can you learn from this success story and benefit from these learnings in your own training? I've summarised the most important lessons below and given some digestible, bite-size practical advice for each. Make your easy training easy and your hard training hard. The more Adam learnt to dial down the intensity of his easy runs, the better he felt and performed in his key workouts each week. Specificity is king in the final 8-10 weeks before a race. That's why we had such a strong emphasis on threshold and race-pace training. If we had kept doing it for 4 or 5 weeks more, we would probably have seen greatly diminishing returns from that same training. But for 8-10 weeks, you can keep improving. What is your goal race and goal intensity? Work backwards from that, and plan your key workouts for the final training phase accordingly. Make core training a priority. Adam took the point, and when short on time, learnt to rather cut a run short if needed in order to still get in his core training. You should too! The treadmill is a great tool to get in quality runs when conditions are less than ideal. It's also great for time-efficient training at lunch break at work, or at a hotel when travelling. If conditions or time-constraints threaten to reduce the quality of one of your key workouts, make liberal use of the treadmill to get that session done, and done with the quality required. Using a running power meter like Stryd really opens up a world of new possibilities for planning, executing and analysing training. In Adam's case, it allowed him to do quality workouts on the treadmill by following his power zones, ignoring the often very misguiding pace given by the treadmill. It also allowed us to identify Running Effectiveness as an area for big improvement and make Adam a significantly more effective and economical runner by the end of this program. 2. Use power zones alongside pace when prescribing and executing workouts. In some cases (e.g hilly courses, treadmill runs) you should use power only, not pace. 3. Assess your Running Effectiveness at your key intensity ranges and start tracking it. No scheduled recovery weeks. This is a bit of an unconventional lesson, and not something I'd recommend for anybody, but for Adam, it ended up working well. The thinking here was that due to Adam's unpredictable work and travel schedule, he could suddenly get a couple of days where training (either any training or at least hard or long workouts) was all but impossible anyway. So we would use those breaks as recovery blocks, and adjust the schedule as needed for after them. If you are in a similar situation, this could well be a good strategy for you as well. Getting too locked into a set program is never ideal. Let it ebb and flow with your life and other demands. Adam's endurance journey continued, even after achieving his running goals. At the moment of writing this, Adam just competed in Ironman 70.3 Finland and achieved a breakthrough result of 5:05, finishing 55th out of 249 in his age-group. Without turning this into a big write-up of that journey too, I do want to list some key learnings from this training chapter. Lunch-break rides on the work gym Wattbike. Doing part of the commute to work as a run (then taking the train the rest of the way). "Sacrificing" the swim - knowing that Adam is a front-pack swimmer anyway. He just couldn't fit in the three (or five...) weekly sessions needed to improve his swim. So instead, he sacrificed improving his strongest discipline. Adam needed just one weekly swim to maintain it, and focused the additional time on riding and running instead. Doing a crash block of training out at a training camp with myself in the Algarve in Portugal one month before his race. Adam trained a lot here, and some of it was quite hard. But most importantly, he got in a massive block of volume on the bike, that gave him a big fitness boost that he carried through to the event. CTL = Chronic Training Load; TSB = Training Stress Balance. For more information on how to interpret the Performance Management Chart, see this article. Moving back to the UK undoubtedly came with a lot of training challenges. Primarily becoming very time-crunched, resulting in a bit of a loss in his training consistency. So it was very important to reset expectations for the 70.3 race accordingly. Adam decided that his primary goal would be to just complete the race and enjoy it, and if he could do it in faster than 5:30, it would be a nice bonus. As you can see, racing without any pressure on himself, he managed to really outperform himself on the day with that 5:05 finish! This is another important lesson in the importance of setting your expectations right. Hopefully, you have learnt some valuable lessons from Adam's story to implement in your own training. There is absolutely no stopping you from achieving your triathlon or running goals if you get the planning and training process right. And believe me, I didn't spend a ridiculous number of hours researching and writing this post for you to just read it, think "that's nice" and move on without reflection. I want you to reflect on your own training, and use this real-life case study to improve at least one thing in your training. Please post what you will do or implement in your training in the comments below. And if you have any questions, don't hesitate to ask! In case you want to really maximise your chance for success, consider applying for coaching or coming out to Portugal for my next training camp.